Handeni Gold Inc. update on exploration and related activities. Vancouver, British Columbia, March 1, 2013 — Handeni Gold Inc. (the “Company” or “Handeni Gold”) (OTCQB: HNDI) is pleased to provide an update on the exploration activities on its exploration licenses in the United Republic of Tanzania. The Company is continuing its ground exploration program on the 17 airborne geophysics targets identified on 800km2 of high grade, metamorphic rocks of Proterozoic age, with lode gold potential. Following on the drilling of approximately 10 000 m on its Magambazi East and Kwandege targets and the subsequent upgrading of the Kwandege target to project status, the Company successfully delineated a substantial gold geochemical and geophysical anomaly on its target 5, situated 18 km South East of Kwandege (Fig. 1), as previously reported. A soil sampling program on Target 6 (in collaboration with the Tanzania Geological Survey) was recently completed (Fig. 1). A total of 2756 soil samples collected on an area of approximately 16 km2 are currently being prepared for Au assays as well as being analysed by XRF for a range of major and trace elements. Ground magnetic and radiometric surveys on the same area are planned to be completed before the commencement of the rainy season in April. The Mjembe area (Target 7) was selected as a priority target based on (i) airborne geophysical evidence; (ii) preliminary soil geochemistry during phase 1 of the exploration program; and (iii) mapping. Ground magnetics (233 line km) has been completed and a total of 2190 samples taken to date, approximately 50% of the planned number of samples on this target. Ground mapping delineated suitable structural features for gold entrapment and a program of high resolution geophysics is envisaged on this anomalous area (as evidenced by artisanal activity) pending the outcome of the geochemical analyses. Magambazi East – alluvial program. An area to the east of Magambazi hill (Fig. 1) was selected as a first target and pilot study area to test the gold distribution in various secondary geological regimes in the Handeni terrain. Bulk samples of approximately 3 500 kg each were treated (total mass of excavated samples just over 1 000 tons) by wet gravity separation. Oversize material was crushed in a ball mill prior to treatment. Gold was recovered from the final concentrate by panning. The method is prone to favour the evaluation of the presence of coarser grained gold and is at best an underestimation of the total gold content. Alluvial, fluvial and colluvial regimes were selected. - Forty three pits to a maximum depth of 8,2 m, yielding a total of 145 samples, were investigated in the alluvial regime. Samples were taken every 1 m with an average mass of 3794 kg. The highest panned grade obtained for alluvial samples were 0,14 g/t. - Fifteen pits on colluvial material dug to a maximum depth of 9 m yielded 87 samples with an average mass of 3696 kg. The highest panned grade obtained for colluvial material was also 0,14 g/t. - In the fluvial regime a total of 5 trenches to a depth of 9,2 m (31 samples) and 6 pits (28 samples) to a depth of 6,3 m provided samples with an average mass of 3366 kg and 3674 kg respectively. The highest panned grade obtained was 0,7 g/t from a stratigraphic horizon at a depth of 4,3 m to 5,3 m.
a) The fluvial environment has the largest potential for the extraction of coarse grained gold. b) A large proportion of gold is contained as fine grained gold. This conclusion is based on the fact that geochemically analysed samples of the same locations as the bulk sampled areas yielded significantly higher gold values. c) Some specific horizons in the fluvial horizon yield higher values than others. d) Allowing for a mere 50% efficiency of the applied processes, the overburden, the grade as well as consistency of gold on this target indicated that it is not economically mineable as an alluvial mining program. Preparations are now underway to investigate the alluvial potential of the area surrounding the Kwandege project anomaly as well as several other alluvial targets identified using airborne techniques. The company will increase its ability to extract fine grained gold prior to commencing the next target evaluation phase by acquiring the appropriate equipment. The Company also recently completed a structural interpretation of the complete 800 km2 of its license area. The model stemming from this work significantly increased understanding of the style of mineralization in the area and its relationship to similar deposits worldwide. The similarities between mineralization in the Handeni area and major gold deposits in rocks with the same age and deformation history elsewhere are striking. The Company is applying this information in its current exploration planning and has to date had a 100% success rate in delineating gold anomalies based on the model applied. 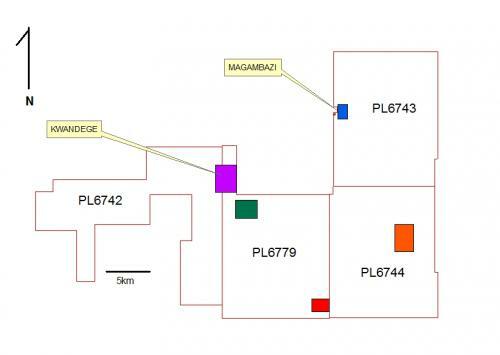 An additional outcome of the structural work is that the Company is re-interpreting the Magambezi East target aiming to refine the mineralization model on the target and may conduct a follow-up drilling program on this target in the future. Fig. 1: Diagrammatic representation of the Handeni Gold license areas with previously drilled targets Kwandege (purple) and Magambazi East (blue) outlined. The positions of Target 5 (red), Target 6 (green) and Target 7 –Mjembe (orange) are also indicated.